Chris Pine | Dr. Saint, D.D.S. In 2009, J.J. Abrams rebooted a franchise that made Trekkies and newcomers “boldly go where no one has gone before”. Without watching the original series, it didn’t matter with Star Trek. Learning the backstories of James T. Kirk and Spock in a futuristic world. As well as being blown away by the visuals and the performances by a gifted cast. It resulted in being one of 2009’s best movies. Despite its flaws, Star Trek into Darkness is a worthy sequel with Benedict Cumberbatch in a menacing portrayal as one of the most menacing villains in the franchise. In Star Trek Beyond, Justin Lin takes out the lens flare and having the movie follow more closely to the show, which Trekkies will likely appreciate. Kirk (Chris Pine), Spock (Zachary Quinto), Bones (Karl Urban), Chekov (Anton Yelchin, who died in a car accident last month at the age of 27), Sulu (John Cho), Uhura (Zoe Saldana), and the rest of the Enterprise crew are three years into their five-year expedition through space. They are thinking of what they want to do with their lives afterwards. For instance, Kirk wants to be a Vice Admiral of Yorktown while naming Spock as the new captain of the Enterprise. All of a sudden, Krall (Idris Elba) and his crew attack the starship. He’s looking for an artifact that would cost the lives of many. The ship crash lands on an uncharted planet called Altamid. They must find their way off the planet. As the writer, Simon Pegg (who also plays Scotty) allows Star Trek Beyond to take enough time to build before discovering the planet. The chemistry between Bones and Spock is the biggest focus. While on the Enterprise, Spock has a conflict between his human and Vulcan qualities. Unlike Bones, he cannot express his human emotions well. It’s always a joy to watch them bond. They provide some of the funniest and most poignant moments. As character-driven as the sequel is, it has the action-fueled energy one would expect from Star Trek or the director. It also features the humor and heart of the adventure. Jaylah (played to perfection by Sofia Boutella) is a great addition to the universe. After voicing Shere Khan in the remake of The Jungle Book, Idris Elba hits out of the park once again as the villain. Live long and prosper, Leonard Nimoy and Anton Yelchin. While Disney is remaking their classic movies for the new generation including Kenneth Branagh’s version of Cinderella coming out in March (which I’m quite looking forward to seeing), we get something a little different. Based on Stephen Sondheim’s Broadway musical, Into the Woods is a musical featuring characters inspired by Wilhelm and Jacob Grimm. following a baker (James Corden) and his wife (Emily Blunt) wishing for a child. 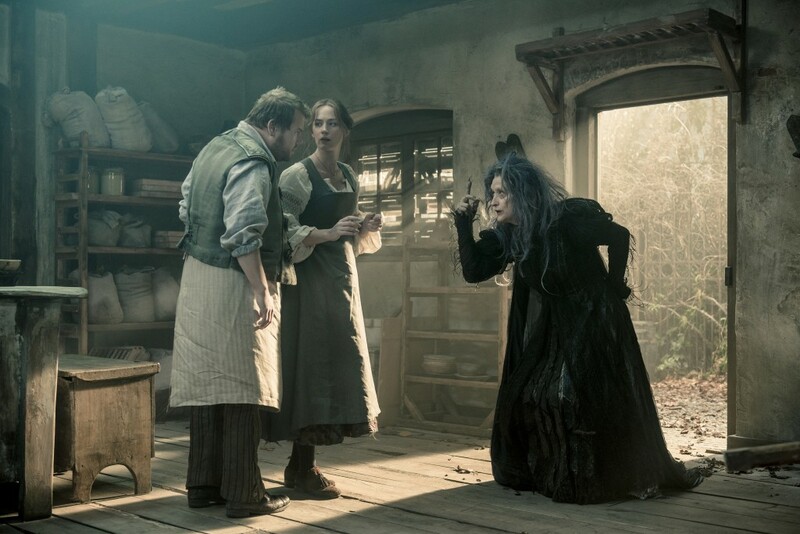 They encounter a once-beautiful witch (Meryl Streep), who has put a curse on the baker’s family tree long ago. They agree to go into the woods to end the curse three days time before the rise of the blue moon to give the witch four items: a cow as white as milk, a cape as red as blood, a hair as yellow as corn, and a slipper as pure as gold. Along their way, they meet Cinderella (Anna Kendrick), Little Red Riding Hood (Lilla Crawford), Jack (Daniel Huttlestone), and Rapunzel (MacKenzie Mauzy), who are out to fulfill wishes of their own. With gorgeous sets and costumes, terrific and well-choreographed musical numbers, and a great performances from the cast (even Johnny Depp makes a big step-up from his last dreadful performance in The Lone Ranger as the Big Bad Wolf), director Rob Marshall (Chicago) and his team make a wonderful musical about having all wishes come true that is witty and charming, and surprisingly dark and twisted that is perfect for the entire family. I cannot wait to buy the soundtrack. One of 2014’s best.